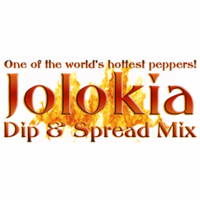 Super Spicy Jolokia (Ghost Pepper) Dip & Spread Mix by All Mixed Up, Ltd.
Made with one of the world's hottest peppers, Bhut Jolokia (a.k.a. Ghost Pepper), to create a super spicy dip mix! But it's not just about the heat - onion, garlic, and herbs come together to make a tasty Tex-Mex dip. No MSG. Gluten Free. Vegetarian / Vegan.